As immigration reform approaches and the semester ends, students hit the streets for racial and reproductive justice. E-mail questions, tips or proposals to studentmovement@thenation.com. For earlier dispatches, check out posts from January 18, February 1, February 15, March 1, March 15, April 2, April 15, April 26, May 10 and May 24. 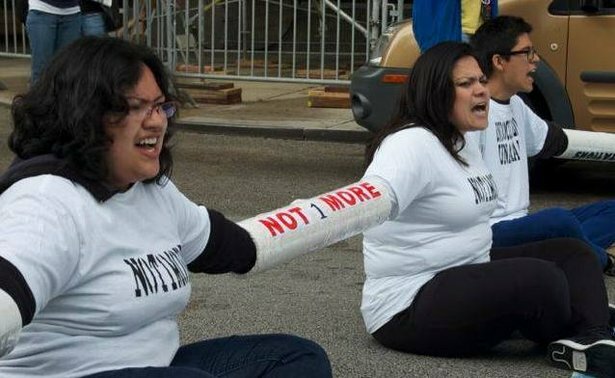 On May 29, the Undocumented Illinois network organized two direct actions during Obama’s visit to Chicago to protest the record increase on deportations and separation of families under the national campaign of Not1More. I was one of twelve participants arrested in front of the Hilton Hotel, where Obama was fundraising for the Democratic Party. All who participated in the civil disobedience are directly affected by deportations, and eleven are undocumented immigrants. Later that day, while Obama was in the hotel, members of UI dropped a banner with Obama’s new title: Deporter in Chief. Today, Congress will start debating an immigration reform bill that could legalize many undocumented people; however, deportations haven’t stopped and we know that not everyone will qualify under the bill. That is why UI will continue to escalate tactics and push Obama to issue an executive order to halt deportations. As a young single mom, I know that I too often receive judgment and too seldom receive support. That’s why one of the best moments of my life was when my two sons accompanied me as I received my high school diploma. But I soon hit a major stumbling block to my plan of attending college. Because I am undocumented, I can’t obtain health care for me or my sons or take advantage of scholarships or financial aid. That’s why I’m organizing with the National Latina Institute for Reproductive Health to ensure that access to health care and higher education is included in comprehensive immigration reform. We support the efforts of Senator Hirono and urge members of Congress to elevate their voices to ensure immigrant families can live with health, dignity and justice. On May 30, more than 200 students, teachers and community allies gathered at Sallie Mae’s shareholder meeting, demanding transparency in lobbying and political donations and imploring their executives to meet with students. While most remained outside, blocked by a wall of police, twenty-two students with shareholder proxies, along with the president of the American Federation of Teachers, presented a resolution for full transparency and challenged Sallie Mae executives on involvement with the American Legislative Exchange Council (ALEC) and their bonus structure—which has allowed the top executives to make millions of dollars while students default on their loans at an alarming rate. After a year and a half of organizing, facing arrests and demanding Sallie Mae executives meet with us, students finally won a meeting with CEO Jack Remondi in June. The US Student Association, Student Labor Action Project, Jobs with Justice and other coalition partners will keep pressuring Sallie Mae executives to work with students to negotiate debt forgiveness. Some two dozen people were in the Sallie Mae shareholders’ meeting with proxy shares. I represented the Florida State University chapter of Dream Defenders. I shared my personal story of being the child of working class Haitian immigrant parents who worked to achieve the American Dream—but had to take out $16,000 in student loans to cover my expenses. The Chairman, Anthony Terracciano, grew annoyed as we confronted him with our testimonies. We stood up one by one until the meeting was cut short. While we were promised a meeting this month—answering one of our major demands—our struggle continues. As a Dream Defender, I fight for the dreams of youth of color—who are less likely to graduate college and more vulnerable to financial issues. Florida Dream Defenders are building collective power and joining in solidarity with organizations like USSA and SLAP to ensure that all can access quality education and flourish. In response to extremely regressive policy proposals in North Carolina, ‘Moral Monday’ mass mobilizations led by the state NAACP have started to gain national attention. The plethora of Republican-sponsored attacks on people of color, youth, the undocumented and the working poor range from voter suppression to a bill that would grant prosecutors discretion to assign juvenile defendants as young as 13 years old to the adult justice system. NC HEAT (Heroes Emerging Among Teens), a group of high schoolers organizing around the school-to-prison-pipeline, have helped to mobilize youth at every Moral Monday—some of whom have participated in non violent civil disobedience. On June 3, “Mega Moral Monday,” more than 150 North Carolinians participated in civil disobedience, and crowds of over 2,000 cheered outside the legislature as they were arrested. In addition to Moral Mondays, NC HEAT, along with the Dignity in Schools campaign, is calling for a moratorium on out-of-school suspensions in Wake County, where there are 20,000 short-term suspensions annually, and in Orange County, where students of color are 17 times more likely to get suspended than white students for the same offenses. We’re pursuing financial support as we gear up for the summer Youth Organizing Institute, where we’ll train new leaders to organize around these issues. Despite its reputation for social justice, UC Berkeley is no stranger to administrative mishandling of sexual assault cases. The administrators responsible for overseeing campus disciplinary procedures (or lack thereof) have persistently been faulted for covering up sexual assault on campus. In April, the Berkeley student government passed “A Bill of No Confidence in UC Berkeley’s Disciplinary Policies Regarding Sexual Assault,” which incited outrage from the administration, claiming students were creating a “chilling effect.” Prompted by this additional evidence of decades-long neglect, nine brave survivors filed a federal Clery Act complaint against Berkeley with the Department of Education on May 21 along with other universities in the IX Network. In 1979, the administration similarly faced a Title IX complaint by the student organization Women Organized Against Sexual Harassment. And just two weeks ago, another Title IX complaint separate from the Clery complaint was filed against Berkeley and the UC Board of Regents for neglecting to respond to a case of domestic violence. On May 28, hundreds of Evergreen State College students, faculty and staff joined the Student Support Services Staff Union for a one-day general strike. The United Students Against Sweatshops chapter at Evergreen worked in solidarity with the union, educating students about the issues to gain support—and shutting the college down to show that nothing gets done without the support staff. Workers and allies want a fair contract, including protection from at-will termination, step wage increases and rewards for seniority. This fight has continued for more than sixteen months, as one third of these staff have left over the year for higher-paying colleges. Support staff remain in negotiations, leaving students and staff struggling to persuade the administration for a fair contract before summer. As seen in the strike demonstrations, though, there are hundreds on campus who support the workers. 8. Student Right-to-Work in Wisconsin? On May 23, the same day the United Council of University of Wisconsin Students won a two-year tuition freeze, the Joint Committee on Finance included a measure in the budget that would effectively strip the council of its funding mechanism—similar to another right-wing maneuver in Arizona in April. One of the oldest statewide students associations in the country, UC, which is nonpartisan, is currently working on veterans’ accreditation, preventing sexual assault and keeping higher education accessible regardless of financial means. UC also engages in a non-partisan voter registration drive across the state that, last year, registered close to 10,000 students and educated 50,000 students on how to vote. Students are mobilizing by canvassing Republican districts and pressuring key targets. 9. Tuition Equality in New Jersey? In January, students across New Jersey banded together to push the NJ DREAM Act, allowing undocumented students the ability to pay in-state tuition rates in NJ colleges and universities—which sixteen states already allow. New Jersey United Students, which represents college and university students across the state, has partnered with NJ DREAM Act Coalition, a collective of undocumented youth, and Anakbayan NJ, acollective of young Filipino activists, to organize for equality. Labeling the campaign as NJTED, New Jersey Tuition Equity for Dreamers, young people have conducted actions to raise visibility, met with key state legislators and pushed local city councils to endorse the act. The bill is up for passage on June 30. Our target: an anti-migrant institution represented here by the Common App, an institution that requires undocumented students to list themselves as “international” to get into private schools when public schools label us “out-of-state.” Our identity: Common App impersonators, hackers. We are a resilient team of undocumented leaders with a bench-mob of radical academics, civil-right giants and illegal-lovers of all denominations. Our message: We are here. The days of anti-immigrant rhetoric and citizen-controlled media are coming to an end. Hasta la victoria Siempre!